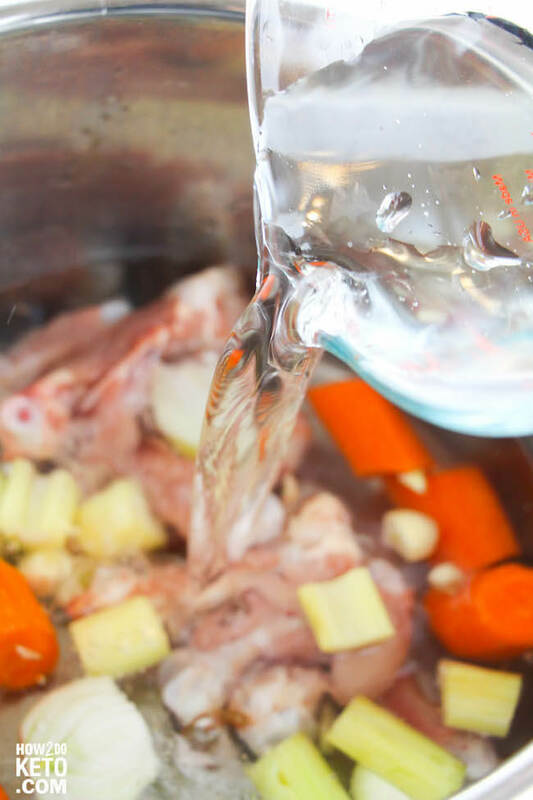 Bone broth is known for it’s amazing health benefits, and now you can make it in less than an hour with this easy Instant Pot Chicken Bone Broth recipe! My mom swears by bone broth and drinks it every day! 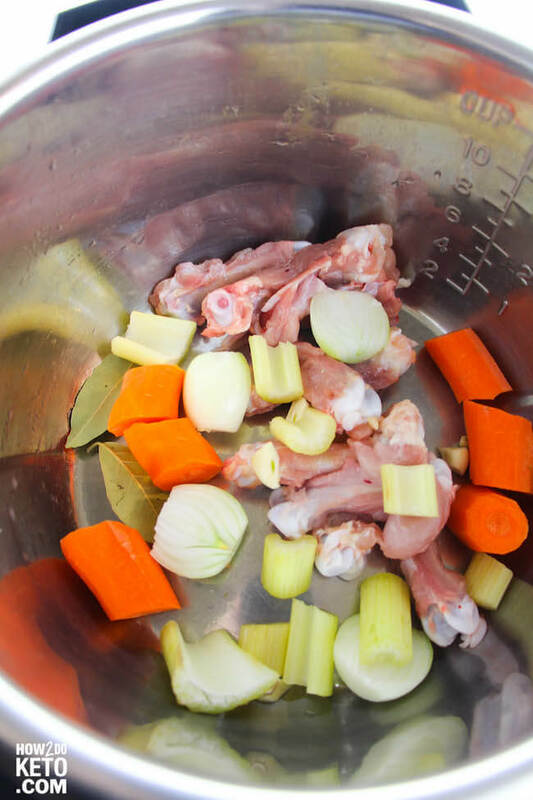 The only downside to bone broth is that it takes forever to make using a traditional method. 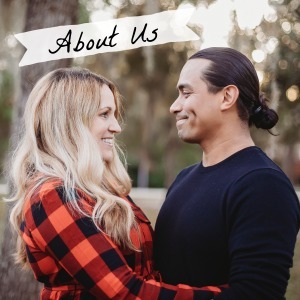 We’re talking a full day! And if you find it in stores, you’ll see that it’s pretty darn expensive. 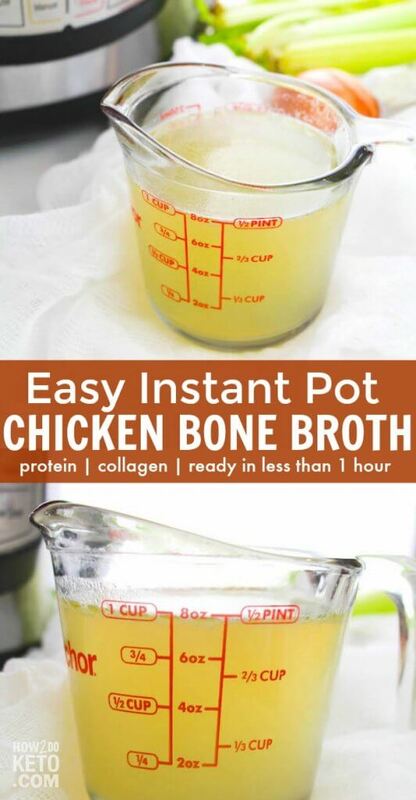 That’s why I’m so excited about this Instant Pot Chicken Bone Broth Recipe! 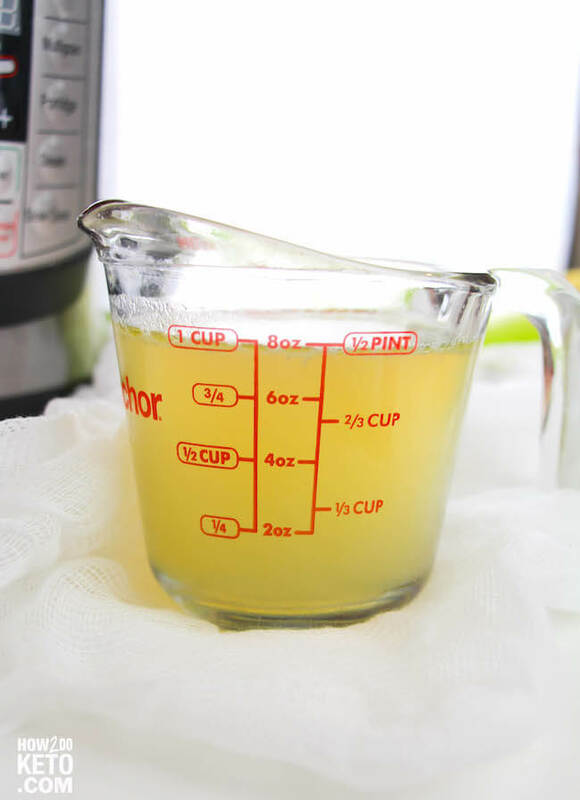 Instead of 24 hours, you can enjoy chicken bone broth in less than ONE hour using our Instant Pot shortcut recipe! Plus, it’s way cheaper to make your own Instant Pot Chicken Bone Broth at home. Use it to bulk up your favorite recipes (like this Warm Keto Asian Noodle Salad) and add flavor, or enjoy a cup by itself for the added health benefits. Or both! 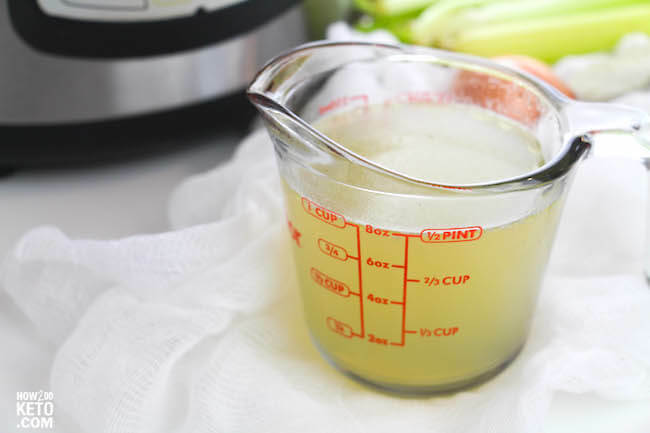 Related: Try our chicken bone broth in our Keto Asparagus Soup recipe! 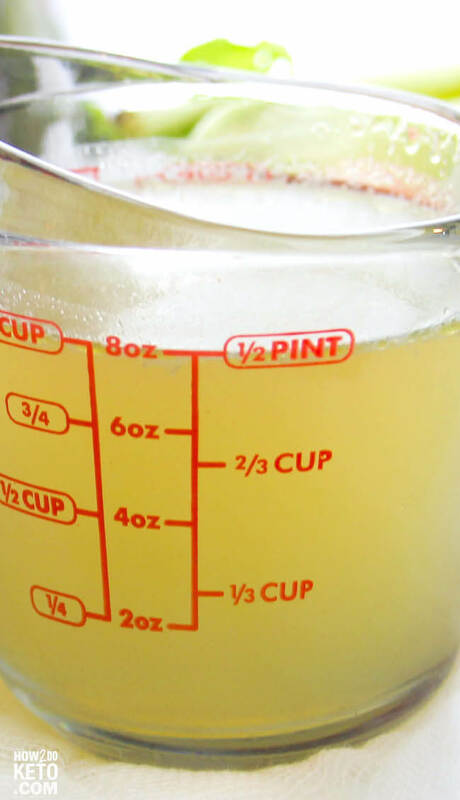 For your convenience in re-creating our Keto Instant Pot Chicken Bone Broth recipe at home, we’ve included shop-able ad links to some of the products and supplies used. Read our disclosure policy here. 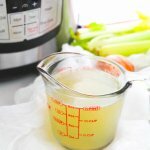 The above is a quick glance at the ingredients and tools needed to make Instant Pot Chicken Bone Broth. Full ingredient amounts are available in the printable recipe at the bottom of the post. Keep reading for photo step-by-step instructions and cooking tips. A full printable recipe follows. If you want, you can sauté the veggies for a few minutes with a bit of oil using the “Sauté” setting on your IP. This will result in a more flavorful broth, but it may be a bit darker/murkier in color. I prefer to use natural release, but you can use the quick release if you are pressed for time. Just be aware that since this is a soup and there is a lot of liquid in your Instant Pot, there is more of a chance for splattering with quick release. After straining, the meat can be removed from the bones and used in soup, and veggies will be perfectly cooked! Related: See more of our favorite Keto soup recipes here! 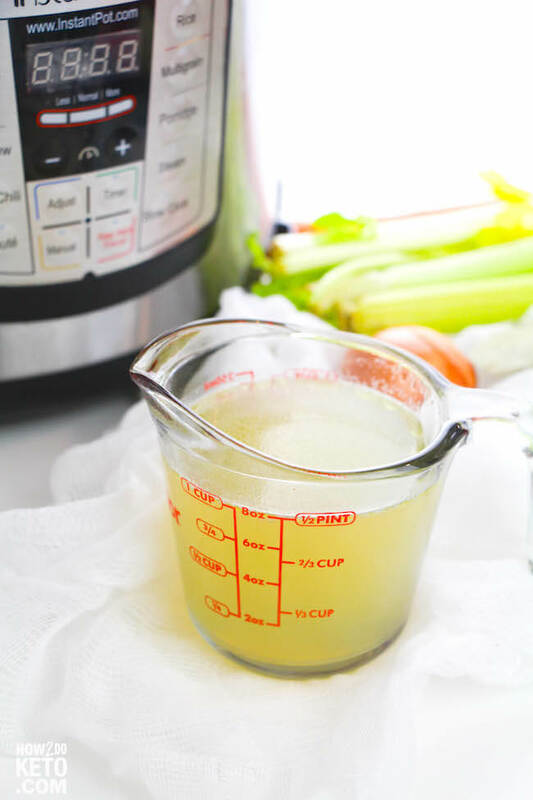 Bone broth is known for it's amazing health benefits, and now you can make it in less than an hour with this easy Instant Pot Chicken Bone Broth recipe! Chop up your veggies and place in the Instant Pot. Add the bones and bay leaves, then fill your IP about 3/4 of the way full with water. Secure the lid and select "Soup/Stew," and set timer to 45 minutes. Carefully pour the broth through a sieve/strainer to remove the vegetables and bones.